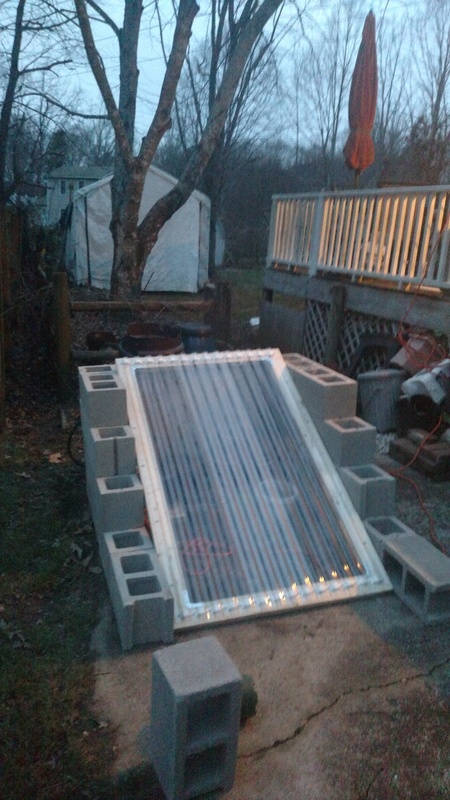 Two weeks ago (Feb 15), I finally got around to assembling the cold frame cover and filling the cinder blocks with mulch (for insulation). I also rotate whole setup so the frame faces East (or near about) so it can get some morning sun. When I originally build the wall, it faced north so I could look out the kitchen window and see just how things were going. The problem with this was that it got basically no direct sunshine; the plants were basically in shadow all the time and the interior never got any significant heating from the sun… which is the whole point of a cold frame. In a way, it actually wasn’t a “cold frame” because I put a small heater inside to keep the severest cold of winter from completely freezing the potted bushes I had put in there. As it was, that kind of worked but not to the degree that I had hoped. It ran and I can only assume that it kept the space warmer, but during the coldest times, it ran all the time and I think that eventually tripped the internal fuse and it shut down. I ended up having to unplug it and that seemed to reset it. Still, not exactly what I was looking for since it was shutting down just at the times that I would want it to be running. On the other hand, at that point I had not actually built the cover, I had just placed the clear paneling over the plants inside the frame and the panels were not a very tight fit with the the sides of the space so I probably loss a lot of heat. So back to building the cover… I used 2×4 cut fit between the walls of the cinder blocks and be at about a 45 degree angle. I figured out that an 8′ 2×4 cut at exactly the right place gave me a long and short piece that when put together with a lap joint were exactly the size I was looking for. So two 8′ 2x4s were exactly what I needed. I did make the mistake of initially cutting one of the 2x4s so I had a piece the exact width I needed…then I remembered I had to account for the width of the lap joint…. so I needed to go by another 2×4. Oh, well, I had to go to Lowes to get corner brackets anyway, if I was going to assemble this thing. Once I have cut the 2x4s to the CORRECT lengths, it was a simple process to use the corner braces to assemble the frame then put the clear panels on top. I used the screws specifically designed to attach the polycarbonate panel. I then tried to trim the excess polycarbonate with a box cutter and that like of worked but left a ragged edge. That I needed to do at the time is break out Dremel oscillating cutter and use that… which I can still do, eventually. Looking at the plants that have been wintering in the coldframe, they do seem better and have suffered let cold damage this winter. How well it worked will really depend on how the plants leaf out, and that is still a ways away. One of the things I do need to remember to do is WATER the bushes. I am protecting them from wind and keeping the temp from getting too cold, but I still need to water them.